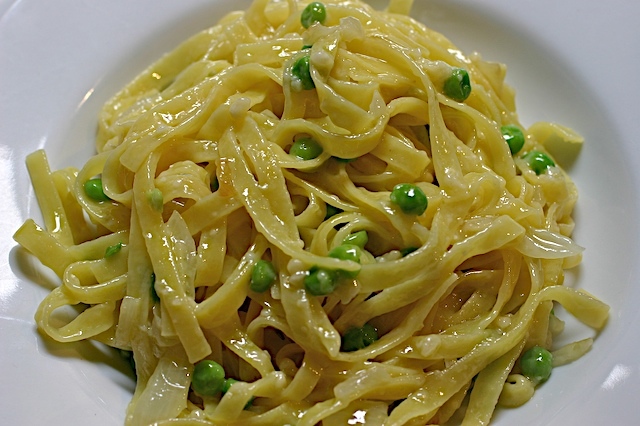 Spaghetti carbonara in the US is often a gloppy, gluey, creamy mess. True Carbonara is absolute simplicity: cheese, bacon or pancetta or guanciale, egg, whisper of garlic. I’ve been putting pancetta in everything, so today I said, “Basta!” and went with a vegetarian variation. And, I have a confession to make: I used some frozen peas. My husband threatened to out me, but there, I done it myself. I never said I was a saint! In the time it takes you to boil the water, and cook the pasta, this dish is ready. Brown your pancetta or bacon, if you are using garlic, crush a whole clove, toss it in while the pancetta is browning in some olive oil, but don’t let the garlic get brown, when it starts to brown, remove it and discard. When the pasta is cooked, drain and place in the pancetta pan and toss with ¾’s of the cheese. Let’s say for two people, use ½ cup of grated parmigiana, or a combination of parmigiana and pecorino. Bring it to the table, crack a raw egg over it, toss thoroughly and serve immediately with the rest of the cheese. That’s it. Simple and satisfying. Finely chop an onion, sweat the onion in a warm pan with olive oil. Don’t let the onions get any color. Add those frozen peas. Drain the pasta, toss with the cheese as above, crack in an egg, and you are good to go. Now the egg part might give you pause. Personally, I love raw eggs as an emulsifier, and we got our eggs from our friend Alvaro. We happened to be in the piazza and he gave us some fresh eggs last night. We treated him to a negroni. Fair trade, don’t you think?